Summary Qualcomm-based three-radio mesh Wi-Fi system with many routing features. 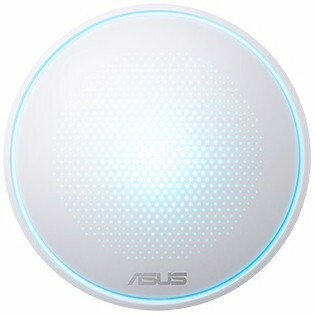 If you're an ASUS fan and have been itching to see what all the mesh/system Wi-Fi noise is about, your time has come. The Lyra Home Wi-Fi System (MAP-AC2200) is the company's entry into the Wi-Fi router market segment currently dominated by NETGEAR's Orbi. When you're late to market, it helps to have a hook to draw in buyers. ASUS' grabber is similar to Orbi's in that you get a web interface as well as Android and iOS apps to set up and tweak the system. But Lyra's web interface provides access to more features than Orbi's, including PPTP and OpenVPN servers and the Adaptive QoS and Trend Micro-powered AiProtection security features found on its RT series routers. Let's first, however, cover the basics. With a diameter of 5.5 inches, a Lyra mesh node (photo top right) is larger than its TP-Link, Google and eero (gen 2) competition shown below. There are two gigabit Ethernet ports and a power port on the rear, but no USB port to lure you into thinking Lyra will some day support storage or printer sharing. Not shown are a reset button and screw slots for wall mounting on the bottom and a Pairing button on the left side. I'm not sure why the Pairing button is there; the app-guided setup process doesn't use it. Lyra's top has a multi-color LED beneath that changes to indicate status. ASUS didn't delay release of the FCC inside photos, which have nice closeups for component identification. What we find is another design based on Qualcomm's quad-core IPQ4019 2x2 802.11ac SoC. The four smaller 5 GHz and two larger 2.4 GHz antennas are clearly visible in the photo below. Antennas for the two (!) Bluetooth radios are etched onto the circuit board. The next photo, with heatsinks and RF can tops removed, isn't clear enough to identify components. But you can see the switch near the two Ethernet connectors, main SoC with outboard RF amplifiers and 5 GHz filters below it. The second 5 GHz radio is at photo upper left. RAM, flash and two Bluetooth radios are on the other side of the board. The FCC document has other photos showing many of the key components, which are summarized in the table below with Google Wi-Fi, eero gen 2 and TP-Link Deco M5. The radio power amplifier components came from WikiDevi; the flash capacity came from an ASUS reviewer's guide. It's pretty clear Qualcomm dominates the Wi-Fi System market segment right now. I haven't seen a Wi-Fi system yet with anyone else's chipset inside.